Ginger + Greentea + Mint Salt Scrub is possibly the most ancient of healthy skin and wellness remedies containing beneficial nutrients and minerals. Indians and Chinese are believed to have grown ginger as a tonic root for its flavor and fortune for over 5000 years, understanding that Gingerol, as its medicinal substance can be ground and dried to give us its many gifts. With its ginger fragrance soothing the skin like it soothes the stomach, its exceptionally high dosage of Vitamin C and Silicon for healthy skin, hair, nails, and teeth - is one of the most important ‘warming’ herbs in the world. With its anti- bacterial - antifungal and natural antibiotic skills, it acts as an anti-inflammatory skin treatment for eczema and mild skin conditions. As it warms the body from the outside in, it is excellent in summer to increase sweating - so cooling down the body. Native to Europe’s Mediterranean region Spearmint, with its menthol aroma similar to peppermint, offers a cooling sensation that has a calming effect on the skin as well as the digestive system. 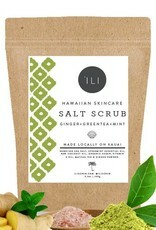 Known to reduce body temperature, relieve fatigue, fever and muscle pain in a mint bath this scrub offers a similar gift. Known to be used for skin conditions in Ayurvedic medicine, it is mild when used on the skin and considered a safe oil for children and people with sensitive skin. Matcha Greentea has long been used as a traditional high-grade finely ground tea in Japanese culture for 100s of years. This particular Greentea has become famous for its high antioxidant content with ongoing research into the use of dried young Greentea leaves in healthy skin care products. Matcha Greentea is rich in vitamin C & E and ingredients like caffeine with the antioxidants - polyphenols - Catechins - studied in Japanese experiments - shown to act as a detoxifying immune stimulating agent with anti-inflammatory, anti-viral capacities – that reduce signs of skin aging. The process of oxidation produces unstable chemicals in the human body called ‘free radicals’ that damage cell membranes. ‘Antioxidants’ are compounds in natural foods that scavenge and neutralise free radicals. Today Matcha Greentea is called the anti-aging savior. Widely respected to protect skin from damage caused by free radicals its transforming antioxidant ‘power’ and hydrating brightening ‘essence’ is easily absorbed into the skin leaving you looking younger! Sea salt is known to increase circulation; open pores, plump skin, absorb toxins from the skin and exfoliate like a champion. 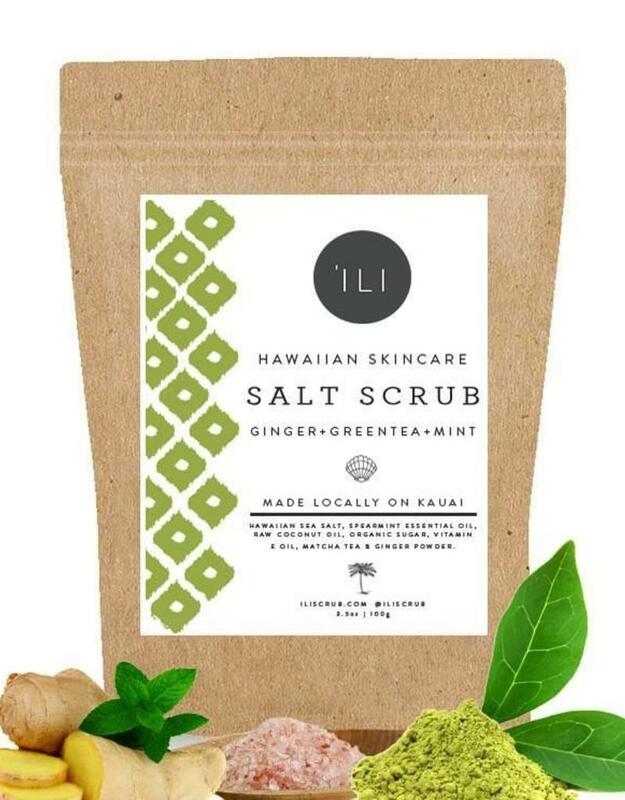 We’ve blended the finest salts with nutritious, super moisturizing organic oils and essential oils of Spearmint & Raw Coconut oil, Ginger root & Matcha powder deliver a deliciously refreshing skin smoothing body scrub. These powerful antioxidant ingredients provide skin soothing properties, aid in skin renewal, and assist with environmental skin protection. Why should I use ‘Ili? As we age, our skin stops making new skin cells as quickly. Old skin cells start to pile up unevenly on the skin's surface, giving it a dry, rough, dull appearance. Exfoliation is beneficial because it removes those cells that are clinging on, revealing the fresher, younger skin cells below. Exfoliation also makes it easier for the vitamins, minerals, and nutraceutical - healthy foods and oils in our products to penetrate and nourish the skin.